HOLLYWOOD – Sir Edwin Fluffer uses his super-stardom to recall the Hollywood Super Stars of yesteryear. Tonight: John Vernon. When I first met John Vernon I didn’t know I was meeting John Vernon. A handsome man, like a hungover Richard Burton – which is to say like Richard Burton – came up to me and said in a light Canadian accent: ‘Hello! I’m Adolphus Raymondus Vernon Agopsowicz.’ As quick as lightning I told him: ‘That won’t do. You’ll have to change it.’ ‘Any suggestions,’ he gamely replied. ‘Adolphus Agopsowicz of course,’ was my immediate response. 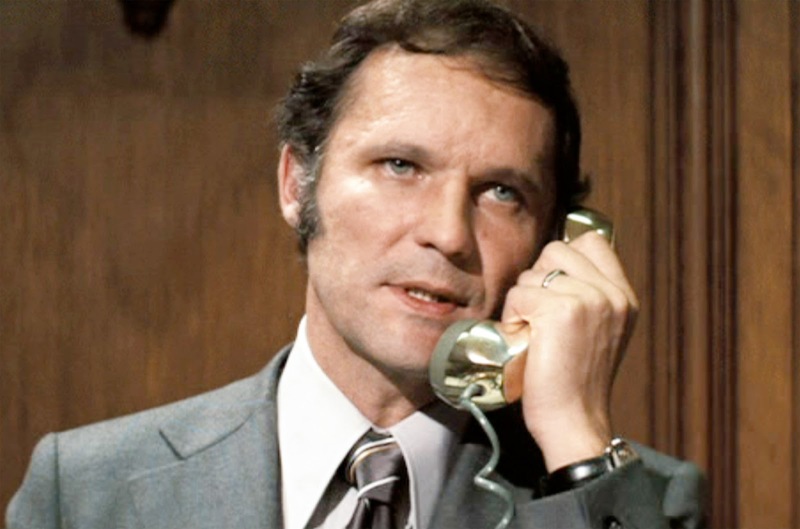 Cooler heads prevailed alas and the world knew him as John Vernon. If you’ve ever seen a film made from 1965-1995 you will have seen John. Prolific and often – unfairly in my view – cast as the villain. From Dirty Harry to Animal House, Outlaw Josey Wales to Herbie Goes Bananas, John showed up, purring like villainy itself had been mixed with ginger and gravel, popped into a blender with something feline and poured over ice. His leonine head and steely blue eyes made him perfect for the crafty official, the charmer who would stab you in the heart while caressing your nether regions. And he was good at playing villains too. He amassed years of TV work as well. I remember when he got his first job in Bonanza, he was so happy he actually bought me a drink. An earl grey laced with Armagnac. I had it framed. Of course we had a lot in common. Both RADA trained, as a party trick we would have ourselves blind folded and still find our way back to Los Angeles from places as far afield as Las Vegas or Seattle. John died, as we all must, but I’m sure when he got to meet the big Executive Producer in the Sky he said with a twinkle in his eye: ‘I was a Cuban in Topaz’. For more Fluffer please be so good as to CLICK HERE.